24K gold-plated whistle that is displayed in a velvet lined, walnut case. Personalize this whistle for a coach or referee. 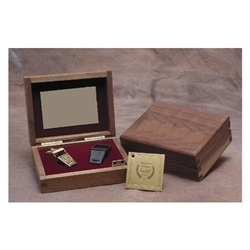 The walnut display case measures 4.5" x 3.5" and includes a rubber whistle protector. This is a commercial version of the same whistle that is presented to the Super Bowl referees each year. Our price includes your free text which is added to a gold metal plate that attaches to the inside the lid of the box. No personalization is done directly on the whistle.